One of eight known weighing over 100 grams found by a metal detector, Hampshire 2016. 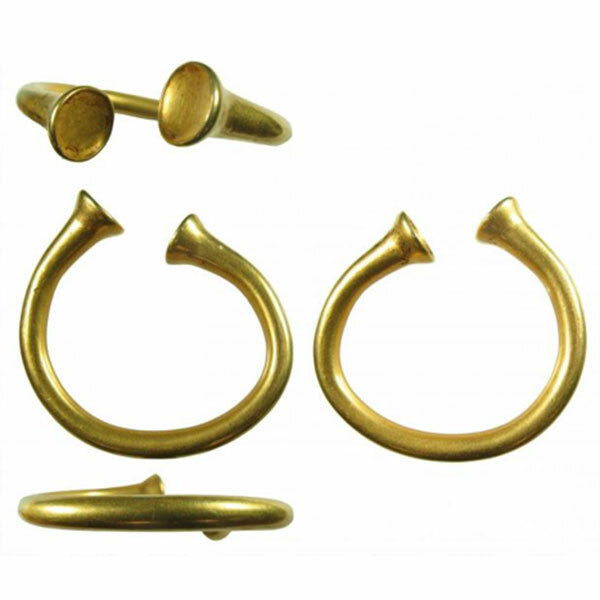 A Late Bronze Age (c.1150-750 BC) solid gold penannular armlet or bracelet with a roughly circular cross-section and expanded, dished terminals. At the centre of the bracelet the cross-section measures 7.4×7.1mm. This begins to expand c.14mm before the terminals, widening to 10.2mm before the terminal flares over c.5mm to c.15mm in diameter at the very end (the internal diameter measuring c.13mm). One of the terminals is bent upwards, away from the other. Both terminals are angled at c.45 degrees and it is unlikely they would about each other. Both terminals have raised edges c.1mm thick. They are both dished to a depth of 1.7mm at the centre and retain traces of a dark brown substance (this is also evident to the outside of the widening and flared areas behind the terminals). The armlet/bracelet measures 69.9mm long, 68.9mm in max. height and weighs 129.2g.